The furniture is out and in place, so it’s time to create an inspiring outdoor area that you love, whether it be for working, entertaining or just relaxing. 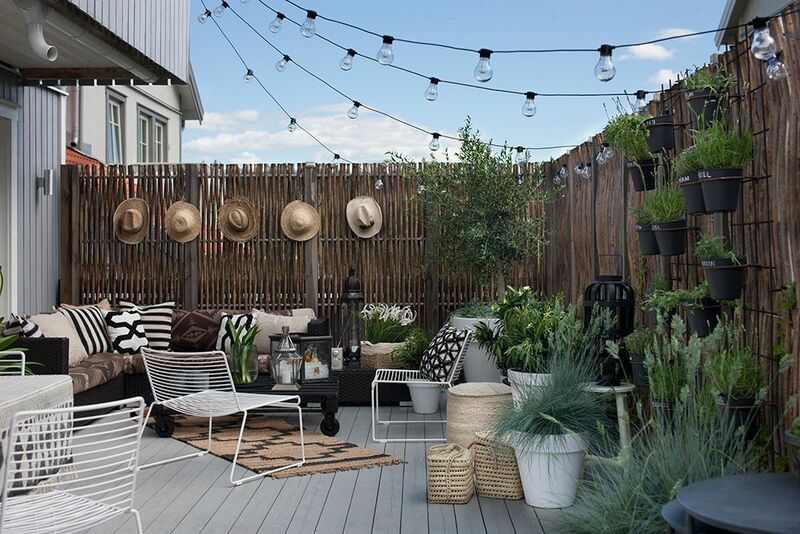 Styling an outdoor space is the easiest way to update it without having to spend an arm and a leg. What’s your vision? If you are not sure what you want the space to look like, get ideas and inspiration from our Pinterest page. We set up boards with different styles of outdoor spaces – from rustic to bohemian. Read on for styling tips and some of our favorite looks. Seating takes many forms, so if you need to add to your existing patio furniture, think outside of the box with dining chairs, a bench, hammocks or even floor pillows and poufs. Adding pillows in an array of colors, patterns and textures brings life to last year’s furniture and sets a vibe depending on the style you choose. Rugs make the space feel finished but depending on the weather, a rug can potentially dirty very quickly. Make sure to buy an outdoor/indoor material that is easy to clean. We love Dash and Albert, Jaipur and Surya! Use the rugs to section off different areas and create floor flow so your outdoor area feels like an extension of your home. Nothing brings life to a space quicker than fresh greenery, herbs, or flowers. In a city? Use a window box! When thinking about potted plants, big is definitely beautiful. For a dramatic, inspiring look, large, matching pots containing luscious, fresh plants make a statement and can also be strategically positioned to help with privacy. For a rustic, inexpensive option, keep the mismatched collection of old planters you’ve accumulated over the years and update them with a coat of paint or a shawl of burlap, complimented by some newer concrete pots. Creating small vignettes gives an image of sophistication right off the pages of a magazine, or pinterest! Put your favorite things on a shelf and accent it with colored plants. Throw any group of random items together on a tray, and it somehow looks intentional and chic. Bonus, you can use the tray for bringing out refreshments when entertaining. Mirrors are a fabulous way to make any room look larger, lighter and brighter – and they work just as well outdoors, too. If you have a small courtyard garden, consider strategically positioning an outdoor mirror or two to ‘double’ the size of your garden zone. Hanging plants and ivy over the edges add a magical feel. What's the ambience you are striving to achieve? Think string lights for a softer, magical feel or lanterns for a nature-like atmosphere! Now your patio should be styled and ready to go. Time to work on inviting some friends over- stay tuned for entertaining tips from our team!